Brother, David Asamu Olaniyan was born to Mr. Abel Olaniyan and Late Mrs. Anike Olaniyan on November 12, 1954, at Agboro, Ayetoro, in Ogun State, Nigeria. 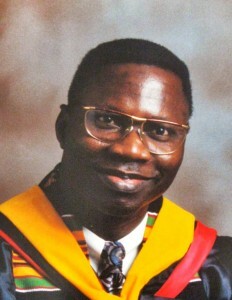 Twenty years later He went back to school to complete his high school education at Sussex Technical School Ijaye Ojokoro and gained admission to study Accounting and Economics at Essex County College in Newark, New Jersey in the United States of America. After earning an Associate Degree he proceeded to Rutgers University where he obtained a Bachelor of Science Degree in Accounting and Economics. He unofficially left the Watchtower Bible and Tract Society in 2009, believing that the organization is preaching false doctrines and predicting false prophesies, such as the end of the world in 1914, 1925, 1975, to name but, just a few. (Deuteronomy 18: 20-22, I John 4:1,6, John 10:7-9) He deferred going to College for 20 years because he relied on the Watchtower Society’s prediction that the end will come in 1975. After seeing all the failed prophesies and becoming tired of being manipulated and lied to, he left the Watchtower Society without being disfellowshipped and started researching in the Bible and about the Watchtower Society’s past history. David also came to see that each member is an agent of the organization. Love is conditional and is based on loyalty to the organization rules and doctrines. Promotion to another rank in the organization is based on work prescribed by the organization, not on work of faith and Holy Spirit.